This is Wally Berg, calling you on the 13th of October from Ang Temba’s house in Pangboche; all the way down to about 13,300 feet. We awoke this morning to a cold Gorak Shep - a beautiful Gorak Shep - I noticed for the first time when the Sherpas made the round’s to give morning wake up tea that they had to put some effort to awakening each member. Everyone had slept soundly all night after a rewarding and exhausting day walking up to Everest Base Camp. The morning, as I said, was cold, but very beautiful and clear, with Nuptse, Pumori and the other great peaks around Gorak Shep. After a quick breakfast we began walking down to Lobuche. Steve was moving very slowly in return from Everest Base Camp yesterday, he looked tired. He had an oxygen saturation that measured 69%, indicating that despite the drugs he’s been using from Iowa to prepare for acclimatization he had not being particularly well acclimatized. He seemed fine and slept well though. This morning he was weak so he ended up by taking one of those form of transportation that you have probably seem before from Everest Base Camp’s dispatches. 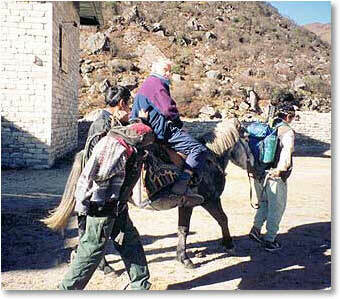 First he was on a sherpa’s back for a little while, later from Lobuche, he was on a horse - on a rescue pony - a small Tibetan horse with a wooden saddle. Steve said that it was not exactly like the western saddle that he was used to but it was quite comfortable and we got quickly down to Pheriche. In the Pheriche clinic Steve saw Eric Johnson, the physician at the Himalayan Rescue association clinic. Eric listened to Steve’s lungs and said that he had a non-clinical pulmonary edema. Steve had it before when he tried Kilimanjaro and this time it seems that despite the prophylatic drugs that he tried, it occurred again. Eric suggested that we move on down to Ang Temba’s house in Pangboche and trusted that the descent of 4500 feet from Gorak Shep all the way down to Pangboche would be enough to take care of the beginning fluids that were building-up in Steve’s lungs. The walk down today was beautiful for all of us. Dafna made the comment that even though we were trekking the same terrain we covered on our ascent to Everest Base Camp, it all looked very different as we go back down the valley. We also had beautiful clear weather. Now that we are here at Pangboche, in Ang Temba’s confortable lodge, we are relaxing, getting ready to have some dinner. It’s been fun to be reunited again with Robb Kendrick - as I mentioned in the earlier dispatch - Robert has become our friend on this trek. He is here doing a photo assignment for the upcoming 50th anniversary of the first ascent of Everest issue of National Geographic. Rob’s beautiful work was on the 1991 National Geographic issue that covered Sherpa Culture and Everest. Steve is resting now; he slept very well on his oxygen in his private room in Ang Temba’s lodge. I checked on him every hour or so, normally just checking the pulse oxymeter on his finger and occasionally waking him up. Every time that I took Steve off of oxygen for a few moments - even now down lower at Pangboche - his oxygen saturation dropped again, so I was concerned. I was concerned enough that even though the pony is still on stand by - the rescue pony - I called the helicopter in from Kathmandu. So, about 9:30am this morning, from a potato field just below Ang Temba’s house, a Karnali helicopter came in, Robb Kendrick was there, to photograph everything. Steve looked tired, but eager to get to Kathmandu. Short time later I talked to Wongchu on the telephone, he was already with Steve in the clinic and of course with the very low elevations in Kathmandu and under the medical care Steve will be fine. We are going to miss him but he is probably going to wait for us in Kathmandu. Steve wanted to go and check in and see if he could visit a trial in Kathmandu, see what the Nepalese legal system is like, compared to his work back in Iowa. He has got plenty of other things to do in Kathmandu as well. We wish him the best and we will miss him.